new media and extremely discerning. LUXURY has its own places of pilgrimage: the upscalestores along Fifth Avenue, the Champs-Élysées, New Bond Street, in Ginza, Via Montenapoleone or Maximilianstrasse. But nowadays the exclusive experience is no longer restricted to the grand boulevards of this world. For a growing number of luxury buyers, the Internet is becoming increasingly important – either as a source of information and inspiration or as a marketplace that presents endless possibilities. How do the Internet and mobile devices influence the buying behaviour of luxury consumers? What does it all mean for bricks-and-mortar retail? Which communication channels are relevant for the individual subgroups of luxury buyers? And how can they be used not just to convey abrand’s exclusiveness but to strengthen it as well? 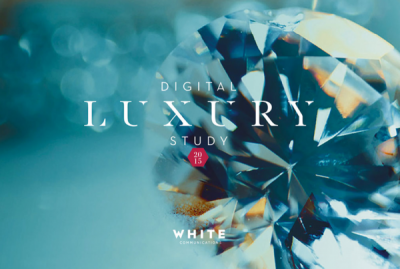 WHITE Communications’ Digital Luxury Study has been providing the answers to questions such as these since 2012. The survey is conducted and published on an annual basis with the support of competent partners like Burda Intermedia Publishing GmbH or cosmetics association VKE-Kosmetikverband. The scientific basis for the research is provided by leading market and social research institutes like GfK nurago and, since 2016, SINUS Markt- und Sozialforschung GmbH. The study investigates and analyses luxury savvy consumers’ online search, information and buying behaviour in depth, thus providing not just valuable snapshots but a meaningful trend barometer as well. The main focus is on affluent luxury shoppers with a net monthly household income of over 3,500 euros who are interested in fashion, shoes, accessories, decorative cosmetics, skincare and watches. When it comes to the exclusiveness of the brands they wear, luxury customers expect high standards. Quality is more important to them than quantity. Their motto: better to have one precious item than several less expensive products. As for getting information about luxury products, heavy buyers prefer media that allow them to choose when they want to use themselves. In addition to periodicals and magazines, mobile Internet devices like laptops, smartphones and tablets play a key role for these consumers, as do Internet-enabled smart TVs. When online, they like to visit the websites and social media pages not just of brands but of glossy magazines as well. While there are those who voice concerns that, in view of this massively expanding Internet presence, traditional upscale stores will eventually become obsolete, the results of the WHITE study do nothing to fuel such fears. If you’re waiting for the big closing-down sale on the grand boulevards of this world – don’t hold your breath. Luxury customers remain loyal to bricks-and-mortar retail. For them, face-to-face contact in the store is an essential part of the perfect shopping experience. Equally interesting for media planning and marketing campaigns: luxury consumers like to decide their preferred time for finding out about luxury products themselves. As a result, multichannel and cross-media solutions are becoming crucially important for brand communications. Almost half of all heavy buyers have already bought something via their tablet or smartphone. Whether or not they go to the sites with the definite intention of buying something – they enjoy getting inspiration from the new trends they find in onlineshops. And that brings us to another area where the heavy buyer proves extremely discerning: the online advertising presence of his preferred brands. Originality, information and an incentive to take a closer look at the product – that’s what he believes he is entitled to expect. And he’s right.